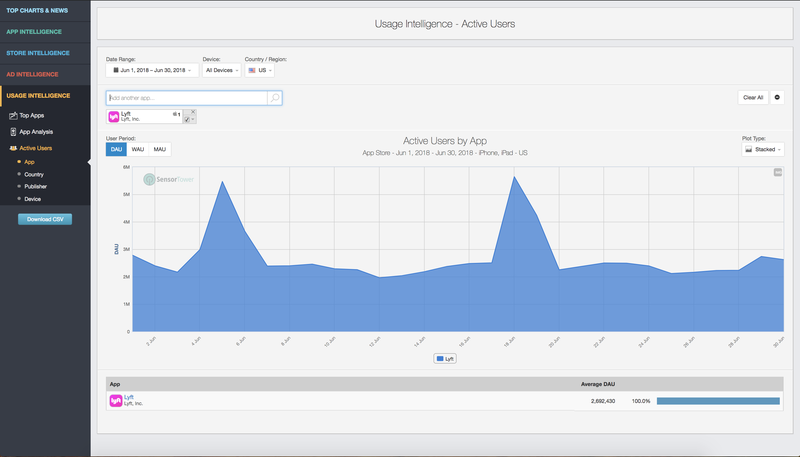 The Active Users Module of Usage Intelligence offers the fastest path to viewing active users for a selected time period for the App Store, graphed by Daily, Weekly, or Monthly Active Users. The Top Apps section shows the top 10,000 apps based on Active Users, however this section gives more detailed on any selected apps. The Active Users Module supplies DAU, WAU, or MAU data for your selected App(s) in the App Store for a selected time period that can be broken down by filters (Country and Device). There are four options within the Active Users Feature to breakdown this data from different angles: App, Country, Publisher, and Device. 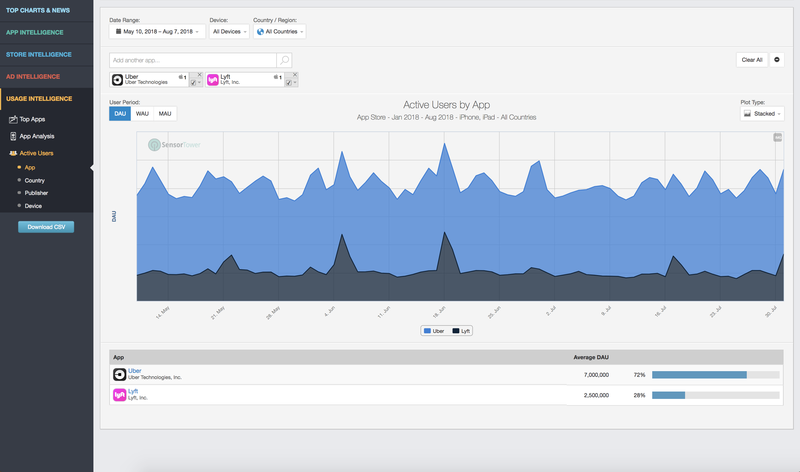 In the Active Users by App feature, we can compare apps DAU, WAU, or MAU side by side within the same graph. 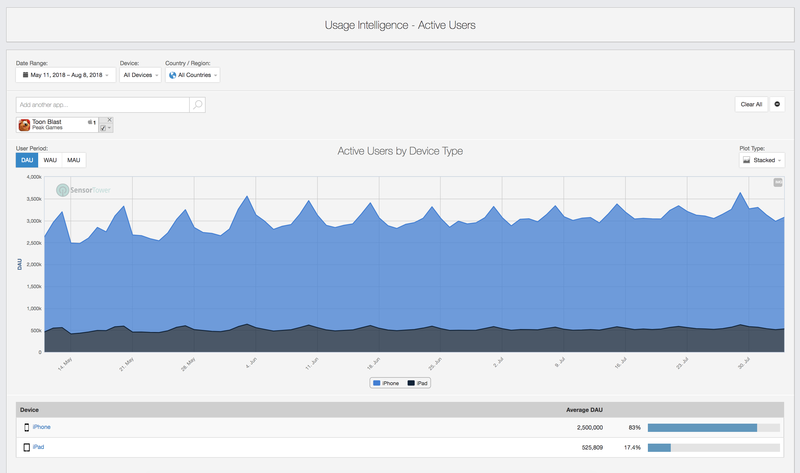 When the data is broken out by app like this, it gives you full access to any apps' daily, weekly, or monthly active users and it creates a graphical comparison of DAU, WAU, or MAU for your selected App(s). This gives you accurate Active Users for each app for any date range. 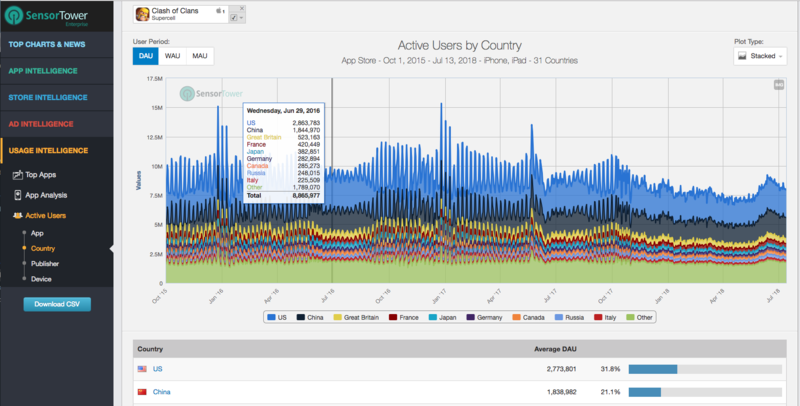 In the Active Users by Country feature, you can break out the Active Users metrics by Country. The graph shows the number of Active Users broken out by country. Select as many countries as you'd like to see how many active users are in each country. We can further filter this graph into Daily, Weekly, or Monthly Active Users. Note: If you have multiple apps selected when breaking the data down by country, the Active Users data for all of the apps will be aggregated for all of the apps. 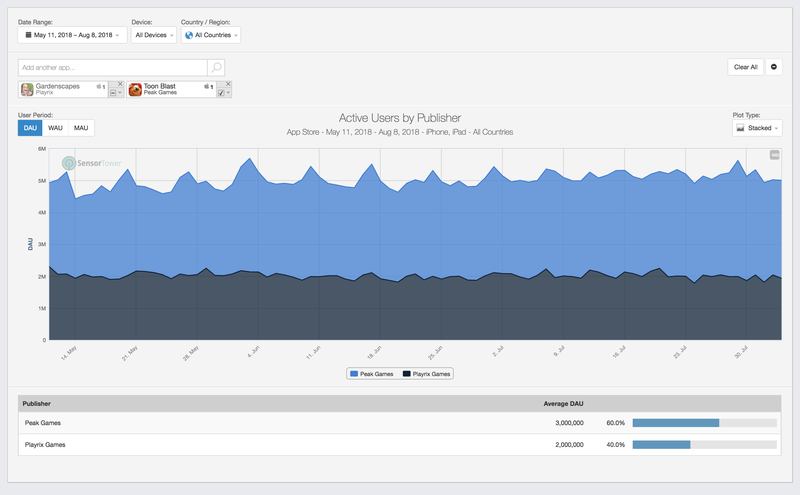 In the Active Users by Publisher feature, we can compare publisher's active users within the same graph for the selected apps. When the data is broken out by Publisher like this, you can view the performance of multiple apps but grouped by their publisher rather than just by themselves. This data can be graphed by daily, weekly, or monthly active users. Note: This data will not include all of a publisher's apps automatically. You must add all of the publishers apps to get the total Active Users for the entire publisher. This will only group the data by the app's publishers. In the Active Users by Device feature, we can compare active users based on device for the selected apps. When the data is broken out by device like this, you can compare how well an app or group of apps are doing on each device. For the App Store, you can compare how well apps are doing on iPhone vs iPad and see which one is more popular and having more users use that device.